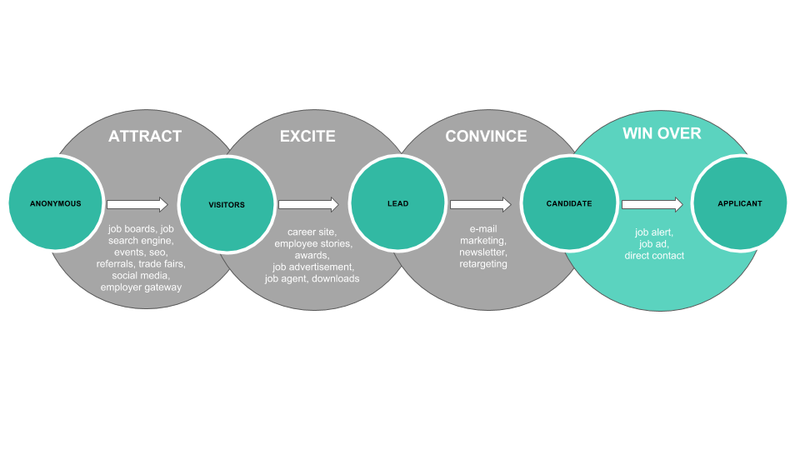 In order to optimize your candidate journey, you first need to understand the current path that candidates must take at your own organization. Put yourself in the position of your candidate and check step by step how you feel about the process that a potential candidate has to go through. In this article, we will reveal six key components of the candidate journey that will help you to evaluate your own process. How high is the searchability of your job advertisements? Check this by googling the job titles of the job advertisements you advertise. You should appear on the first few pages. Candidates usually don’t click further than the third page. What about your social media activities? This is where you can get the attention of desired candidates through advertising aimed specifically at your target group using well-prepared banners. On hardly any other channel can you choose so pointedly where and to whom the advertisements are targeted, for example in the form of job advertisements or your employer advantages. How well can you find your career page? If candidates are on your corporate site, is access to the career site clearly visible? Candidates should not have to search for it for long, otherwise they will leave your company website without any awareness of your job advertisements. Is your career page clearly designed? Can candidates find their way around easily and are there landing pages that describe the individual fields? On a career page there should be different landing pages for the different professional experience levels and departments, for example a landing page for graduates and a landing page for professionals. The landing page should at least contain a suitable picture, a description of the employer benefits and suitable job offers. Have you made your benefits as an employer clear? Candidates should not have to search long for the employer benefits, but should be directly convinced. How suitable is the job advertisement for your desired target group? Do you use a target group-oriented approach? Do you use job titles that have only been developed internally in your company or those that your target group is looking for? Remember that you want to be found and reach your desired target group. Along with the career page, job advertisements represent the first important point of contact between you and your applicants. The decision to apply to your company depends on how well you prepare your job ads. Start concentrating on building up leads today. The majority of anonymous visitors are not ready yet to apply. What conversion options do you offer to identify anonymous visitors? Is it possible to subscribe to a career newsletter or job updates? Do you already have re-occurring contact with your identified contacts today? Do you send out newsletters to stay in touch with them and excite them about your company? Are you already segmenting your identified leads based on your candidate personas? Do you provide target group specific content? Do you use the same form for all job advertisements or do you adapt the forms according to your target group? Do you require the same attachments from a professional with several years of experience as from a trainee? The forms and requirements should be geared to the desired target group. They should require as little effort as possible for the candidate to complete the application.